The space environment features a drastically reduced gravity as compared to Earth, resulting in major adaptions to the physiology of the human body. The cardiovascular system (CVS) is unloaded and the normal head-to-foot hydrostatic gradient is removed. Additionally, the crew members face an extreme sedentary lifestyle resulting in cardiovascular deconditioning and hence to an increased risk for cardiovascular disease (CVD). Protection of the CVS, counteracting the negative consequences at least partially is provided by regular physical activities on the spacecraft. However, exercise intensity and duration applied to date seem insufficient to prevent vascular changes such as arterial stiffness or insulin resistance. The CVS being impaired already by the effects of microgravity may further be more vulnerable to adverse cardiovascular effects of space radiation. 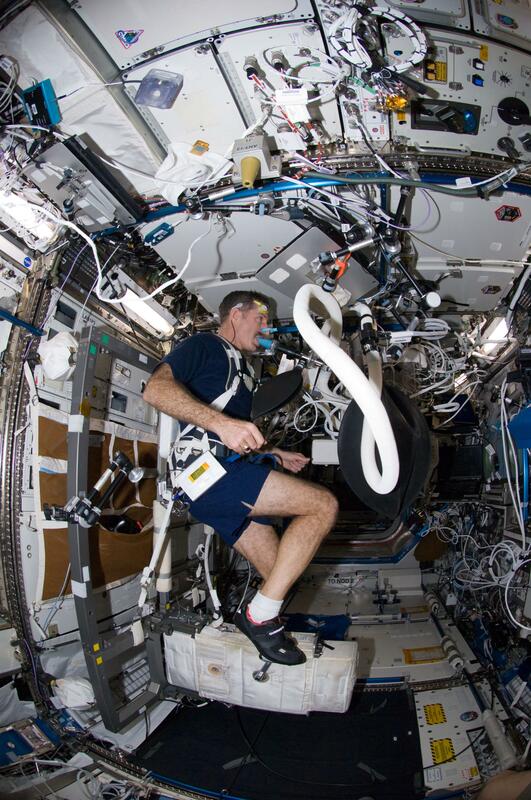 Astronaut Dan Burbank on ISS exercising on the Cycle Ergometer with Vibration Isolation and Stabilization (CEVIS) during a session to measure aerobic capacity in space (VO2). NASA Image: ISS030E022589, from NASA photo gallery, courtesy of NASA. The poor characterization of the biological mechanisms and the virtual lack of epidemiological data for particle radiation exposure impede a proper risk assessment. Additionally, it cannot be ruled that microgravity and space radiation synergistically increase the risk for CVD. The international space agencies and private corporations aim at extended human presence in space (e.g. Moon colony) or even deep space exploration (Mars). Thus, the increased risk of CVD for such missions needs to be addressed and research in the field is urgently needed. The original article was published in Nature Reviews Cardiology in October 2017 and can be found here. Genes (and PCR) in Space!